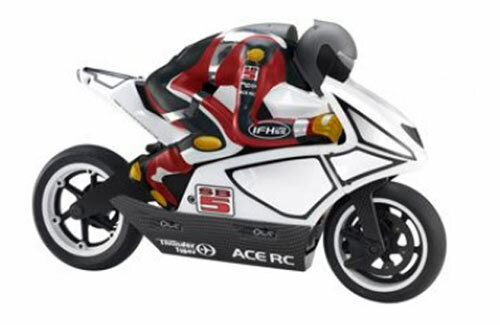 The Thunder Tiger 1/5th SB-5 Electric Super Bike kit is designed to stun and break quite a few of the conventional rules in the RC Motorbike world. Built for speed and high-performance, a quick glimpse of the SB-5 reveals that it is packed with revolutionary features such as a 4mm carbon fork plate front fork, carbon plate chassis, carbon rear swing arm, integrated micro servo in the front break calliper, one piece rider and body, and a quick remove battery tray. Other important details of the new SB-5 bike include an adjustable slip clutch integrated in the 48DP main gear for cleaner exiting on bends, EFRA & ROAR Legal 2S hard case LiPo battery holder, wheels compatible with current standard 1/5th motorcycle racing tyres, and dampers compatible with most 1/10th touring shocks.